Given the utterly huge strides Ducati made this year, this could be difference maker. Iannone was already a borderline alien, providing he finished races. With Casey’s input and perhaps a bit of coaching I suspect he’ll be firmly cemented in the alien class. Glad to see Casey back with the Ducati. Many fine times watching him and the others on TV. Gotta be a super plus to the Ducati program. 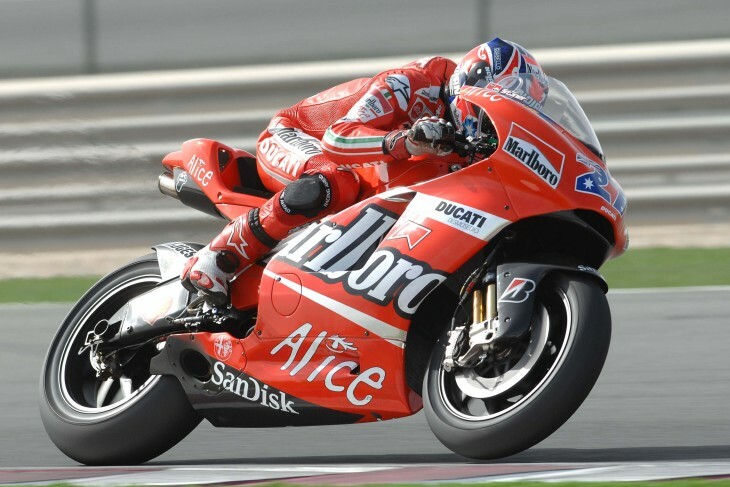 Even after 2007, Stoner showed everyone that the “unrideable” bike was still a potential race winner. With Gigi leading development, Stoner can do it again. This isn’t the first time the #27 followed #4 to a factory team. I’m not going to be shocked if he lands the factory ride by 2017. Ducati is too proud to maintain the status as a laughing stock on the grid. Dovi is a talented rider, but he lost his ride at Repsol to Stoner in the past. Will history repeat itself? One, it just randomly selects posts for “moderation”, which is kinda pointless if you ask me. Or two, certain key words or phrases set it off. If that’s the case, can you tell us what they are, so we can avoid using them in conversation? Sheesh! I mean I can see where some of my attempted post could’ve been viewed as a bit sarcastic/harsh 🙂 but it was all meant in good fun. Which is something this joint could use a little of lol! “Crap” should not cause moderation status. I have asked our tech person to fix this problem (too many comments going to “moderation”), but it remains a problem. Sorry, but we will keep working on it. I think I’ve only seen it with replies I’ve posted, don’t think I’ve seen it with original posts? Tony: Welcome Stoner back. However, it was racing that made CS a champion,not his winning personality. To be an ambassador the hope is that CS has matured into a sportsman who can bear up with grace and style. Brings to mind that few people remember Rod Laver well, the champion who could not sell much while his runner up sold his moustache & wink personality for millions. Duc wants Stoner supporters to buy ducs, yes?. Excellent point. I’m sure he’ll provide great feedback as a test rider. But if they want a real “ambassador”, they should hire Nicky Hayden back! You’re right on the money on both counts! Stoner was a PITA but a very fast PITA. I think it’s outside his nature to be an “ambassador”. But Nicky Hayden, that man could do Ducati a world of good as a spokeman/ambassador. Right on Scott. I’m so sorry Nicky seems to favor Honda even though they screwed him. Nicky could help sell Ducs. I wish he’d have gone to Duc WSB team. Stoner will be a forgotten champion, due to his as some see “whiney” ways. If he comes back, he won’t last long, first good crash. I’m not dissin him much, I’d quit pushing it after some scalpel sessions. It’d be nice if he proves me wrong. When Stoner rode for Ducati, how and why did he have so much more success than other Ducati riders? Whatever it was, it appears to be similar to the difference between Dani Pedrosa and MM this year, when they both rode the 2015 framed-Honda. Capirossi had a fair bit of success with Ducati, and if you read the press release, you’ll be reminded that Ducati won the constructors championship that year. It was easily the best machine of the first 800cc-year machines, to the extent that Rossi was openly jealous and felt it unfair. It was probably the start of the fuel restrictions tighening over the course of subsequent seasons, as the japanese reckoned they were getting alot more fuel through the bike to make it so very quick. The 800 Ducati had a lot more power than the Yamahas and a bit more than the Hondas at the start of the season and I think Casey was the first of the Aliens to really come to grips with the new electronics. That advantage carried over when he jumped to Honda and he was able to do amazing “Marquez style” riding before Marquez. Rossi et al were slower in making the analog to digital jump than Stoner. Rossi, in particular I think, was held back a bit by Jerry Burgess who was, perhaps, the greatest of the analog fettlers but not so quick to accept the digital bikes. 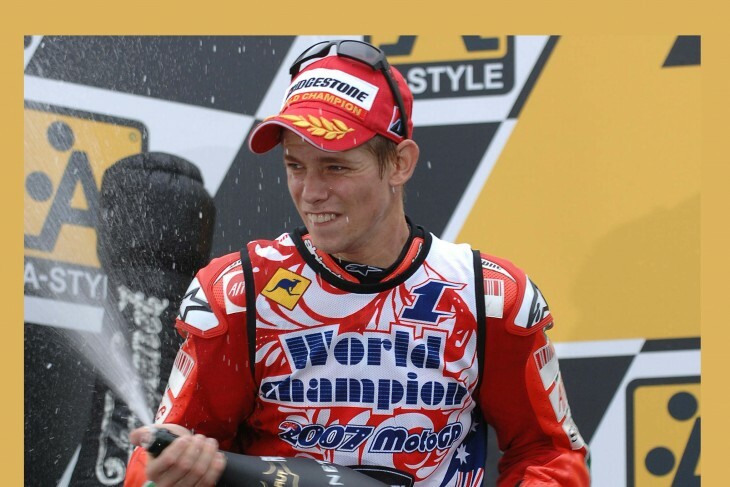 The Ducati was a strong bike back then, but Stoner was clearly a special talent. Capriossi, Hayden, and Melandri, all of whom served as Stoner’s teammate at one time, never achieve results anywhere close to Stoner. In fact, Pedrosa is the only teammate that ever really seemed like he belonged on the same team as Stoner. Great news for Stoner… If you can get work doing what you love… Why not! That Ducati’s got no (aero) wings. That riders’s got no (Honda) wings…. I’m happy for him. Finding a good job is tough right now. Hope it works out. Wonder if working for Ducati will give him a tummy ache again? He may be able to run in the top 4, if he’s lucky. Well it is indeed an interesting development. I doubt he will be doing any wild cards. He can’t afford to. If he does and doesn’t do well, it won’t look good for either him or Ducati. Plus his parting words about MotoGP and his competitors were not exactly “I’ll miss you guys, maybe I’ll come back some day”. His value will not be in racing, but in testing developing and showing up at shows and shaking hands. Apparently the door didn’t hit him on the way out last time. NEVER burn your bridges…. You never know when you may have to walk back that way again! Fantastic. Here’s to hoping he’ll ride a few wildcards, and I really hope they publish his test times, be amazing to see how he compares to the Andreas. Fun stuff. Amen. I’d love to see him ride among the field again. I think it’s all well and good for Stoner and Ducati, but it really confirms to me that he’s probably no longer capable of being competitive with the new group of riders and is unlikely to get any wildcard rides. Not all MotoGP stars age well in a racing sense as we’ve seen with the likes of Elias, Melandri and others. Then there;s the Rossis and Checas of this world so who really knows? What gives you this impression ? He is still young. He only did a few tests a year with Honda, hardly proof of his speed or lack of. I seem to remember that he was at the top of his game when he retired and he might be again. He might not be a ‘celebrity’ like Rossi, Marquez or even Lorenzo but Motorcycle racing is not about personalities, it’s about racing a bike as fast as possible. Nobody will ever say he didn’t do that! Risk aversion may keep him testing vs. racing. He’s a family guy, right? No longer interested in being competitive? More likely. Remember, he walked away on top, talking smack about all things MotoGP while heading for the door.